Simon Bridges was already struggling with the leak issue. This morning Duncan Garner confronted him with another leak, this time over incorrectly filed donations. 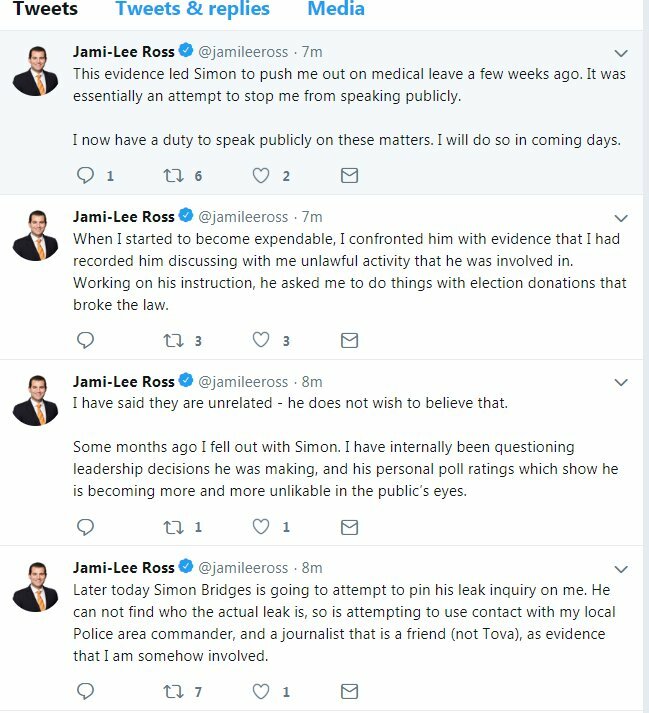 Bridges set up a press conference for 1 pm and Jami-Lee Ross pre-empted that with a series of tweets, claiming he had an incriminating secret recording with of Bridges. Earlier today I received the independent report from PwC on their investigation into the recent leak of the National Party’s travel expenses. The report states that the evidence identified points to Jami Lee Ross as being the person who sent the anonymous text message. I am releasing the report today. John Billington QC has independently assessed the investigation report. It is his opinion that on the balance of probabilities the evidence establishes that Jami-Lee Ross was the person who leaked the expenses and the sender of the text message. I accept both the investigation report and the opinion of Mr Billington. Earlier today I visited Jami-Lee Ross with Paula Bennett and explained to him the report and the opinion of Mr Billington and gave him an opportunity to respond. I was not satisfied with his explanation. I informed Jami-Lee that tomorrow the investigation report and Mr Billington’s opinion will be presented at a meeting of the National Party Caucus along with the other matters. The Caucus will be asked to consider all relevant matters, including his membership of the Caucus. Finally, you will recall Jami-Lee recently took leave from Parliament given personal health issues. This action today is completely separate. I did not know what the investigation report would contain when those matters were addressed in recent weeks. Today I have taken steps to ensure that Jami-Lee has the necessary support around him at this time. The step that I have taken today is not made lightly. I am balancing the health issues with the considerable public interest in the outcome of the investigation. Media are reporting there have been other complaints about Ross. Ross is now clearly done as a politician, no party would trust him after this. Bridges is also on even shakier ground than before as National leader, Much may depend on how he deals with this tomorrow at and after National’s caucus meeting. Another leak, this time of the draft report that led to Labour MP Meka Whaitiri being dropped as a minister. So while Jacinda Ardern walks and talks on the world stage this is another problem she left behind still festering. Willie Jackson in the urgent debate on the sacking of Meka Whaitiri says the Labour Maori caucus "stands by the Prime Minister, we stand by Meka Whaitiri, we stand by the victim, if she has been hurt… we haven't had the evidence yet." Other ministers were standing behind Ardern but Whaitiri wasn’t because no one had told her it was happening. There is no dispute that Whaitiri had words with her staffer for missing the event. The staff member claims that Whaitiri came up behind her in the foyer of the building and grabbed her arm hard and took her outside when she saw Ardern having the standup. But Whaitiri denies physically touching her staff member at any stage. There were no witnesses. David Patten, the Wellington lawyer who conducted the inquiry for Ministerial Services, the employer of ministerial staff, found on the balance of probabilities that the staff member’s version was the more likely explanation. He found that Whaitiri did not pull or drag the press secretary outside from the foyer of the building where the meeting was taking place. But he found it more probable that Whaitiri approached the staffer from behind and grabbed her by the arm and that Whaitiri spoke in a raised voice to the staffer. In evidence to the inquiry, the staff member said Whaitiri had blamed her for missing the media standup with the Prime Minister. “She grabbed me by the arm and pulled me outside and said she needed to talk to me and when we were outside she raised her voice. The staffer originally told the inquiry that Whaitiri had pinched her arm but changed that to grabbed. “It was hard and it scared the living daylights out of me,” she said. Patten questioned the staff member about the bruises, why it took three days to see them and whether they could have been caused by something else such as a door handle. She said it wasn’t until she was at a meeting with ministerial services on August 30 that they asked if there were any marks and until then she hadn’t thought to look. So this issue won’t go away. Even if no further action is taken and Whaitiri remains an MP – she is strongly backed by other Maori MPs – this is likely to keep being used against Labour and questions will keep being asked about Ardern’s leadership. When Jacinda Ardern sacked Meka Whaitiri a week ago, it was on a trust-me basis. She said she couldn’t tell the country why she had sacked the minister, her first sacking, without breaching the privacy of a staff member who complained about the minister — even though no one has named the staffer. She relied on a report by a respected barrister, and after reading it Ardern no longer had confidence in Whaitiri as a minister “at this time”. The draft findings, leaked to the Herald, clearly reveal why Ardern reached the decision she did on the basis of David Patten’s report. On the balance of probabilities he is inclined to believe that Whaitiri was very annoyed she had not been alerted by her press secretary to the fact that Ardern was holding a standup where we see MPs nodding in the background, that she grabbed her staffer by the arm to say they needed to talk outside, and then pointed out to her in forceful language that it was her job to make sure she didn’t miss out on such media opportunities. The alleged grabbing of the arm and the bruises are the clincher, though Whaitiri denies physical contact. Realistically it will be impossible for Whaitiri to return as a minister this term. A byelection in Ikaroa-Rawhiti is unlikely unless the pressure becomes too much. Whaitiri has an unswerving support base in the Māori caucus. So this leaves things in an awkward situation. Meka Whaitiri has spoken to media for the first time since being fired from her ministerial portfolios on Thursday last week. “I accept the Prime Minister’s decision. I’m going to take time now to reflect and look at ways of improving myself to regain the Prime Minister’s confidence. “I’ve got a lot of work to do here on behalf of the people of Ikaroa-Rawhiti. I just want to get on with it,” Ms Whaitiri said. She added she was “humbled” by the support of the Māori caucus. Ms Whaitiri would not say which aspects of the report she disputes or whether she would contest the 2020 election. Ms Whaitiri remains an electorate MP for Ikaroa-Rawhiti and co-chair of the Māori caucus, alongside Willy Jackson. Mr Jackson said she is fit to remain co-chair of the Māori caucus. That support may or may not be sufficient to make it tenable for Whaitiri to stand again in her electorate. if she does the level of support in the electorate will then be tested and measured, but it will be difficult to measure the impact on Labour party support. Perhaps, like Clare Curran, Whaitiri just doesn’t have a suitable temperament or the leadership skills required to be a Minister. The question will remain as to whether this also applies to being an MP. Simon Bridges seems determined to keep the leak of his expenses issue alive. National Party leader Simon Bridges has lashed out at Parliament Speaker Trevor Mallard for cancelling an inquiry into the travel-expenses leak 24 hours after confirming it was going ahead, and suggested he had been influenced by Prime Minister Jacinda Ardern. He said if Mallard or Ardern had any new information, they had a duty to share it with National. If the issue remained unresolved, National blamed Mallard, Bridges said. This is upping the ante somewhat. That’s a serious accusation aimed both at Mallard and Ardern. It pretty much guarantees that the Speaker will not be able to walk away from the inquiry and wash his hands of the issue. On Thursday last week Mallard named Michael Heron QC to conduct the inquiry into the leak. On Friday afternoon Mallard cancelled the inquiry – more than a week after the alleged leaker sent a text pleading not to hold the inquiry. That did seem to be an odd sudden reversal of Mallard’s position. “Nothing had changed fundamentally on the Friday other than that the Prime Minister said it was an internal matter for the National Party,” Bridges said. “Surprise, surprise, Trevor Mallard then changed his position. “I know of nothing that gives any good reason for his change unless the Prime Minister or he knows something we don’t and if they do, they should be sharing it with the National Party,” he said. This should force Mallard too do something in response. Mallard appointed Heron to conduct the inquiry, despite having received the text the previous week. The existence of that text was not revealed until last Friday – and later that day Mallard issued a statement cancelling the inquiry. So a day after appointing a QC to conduct the inquiry Mallard has reversed his decision based on his judgement that it would be “unlikely anyone outside the National Party” would be involved. That seems quite unusual. Speaking on Friday, Ardern said the inquiry should be stopped if it was proven the individual had mental health issues, and it was an internal matter for National. This was also an unusual involvement of Ardern, saying much the same thing that Mallard had said in justifying scrapping the inquiry. Hold on. Why is PM using exact same language as Mallard? Without proof? “This is a matter for the National party” How? I am happy to be proven wrong but here’s the rub – proof. They cite mental illness for not disclosing and then in same sentence accuse all Nat caucus? It does seem odd that Ardern and Mallard are saying much the same thing. The Speaker is supposed to act independent of any party. It seems to be high risk for Bridges to escalate this issue into a likely confrontation with the Speaker, given that whatever the outcome this is an awkward issue for him and National. Does he have information that he hasn’t disclosed that justifies his challenge of both Mallard and Ardern? He has as good as accused them of collusion in scrapping the inquiry. This is all becoming increasingly messy, and seems to be far from over. Bridges is just now being interviewed on RNZ. "I will have an internal investigation, I will seek to determine if it's a National MP or staffer…" @simonjbridges tells us. He takes the leaker's mental health issues "deeply seriously". In his discussion with police there was no advice not to proceed, Mr Bridges says. Bridges leak and Curran semi-demotion: more to come? The two big political stories of the week (in New Zealand) may not be over yet. News of Clare Curran’s semi demotion was dumped late on Friday, and that raised suspicions by media, as it should have. They may get more out of the story yet – or Curran may have learned from her second similar stuff up and become an uncontroversial minister outside Cabinet. There has to be more on the Bridges expenses leaker who played a mental health card, as well as suggesting their life was at risk if the leak inquiry continued. The speaker Trevor Mallard stopped the inquiry, which raises more questions. The self-styled “most open and transparent Government ever” has just ushered in its first ministerial sacking: former Minister for Open Government Clare Curran for less than transparent practices. Curran mislead the House and failed to disclose a meeting she held with entrepreneur Derek Handley, who expressed an interest in becoming the country’s first chief technology officer. It’s her second offence of an almost identical nature and while it was at best a sloppy administrative oversight, it’s left both her and the Government open to accusations of dishonesty. Ardern had no choice but to sack her from Cabinet, but has left the door open for her re-entry as Curran retains ministerial warrants for broadcasting and ACC. And as her first major disciplinary act, not cutting the cancer entirely could be a decision Ardern comes to regret. This story could now fade away, unless Curran does something else to attract adverse attention. Ardern has established a reputation as being prepared to act against erring Ministers, eventually but not particularly decisively. The case of the Bridges leak is so far from closed. Which is why the decision by Speaker Trevor Mallard to call off the investigation makes little sense. But there doesn’t seem to be much about the saga that makes sense anymore. One thing we know is there a person who has mental health issues, who may not be coping in the role and cannot possibly be getting all the help they need because no one knows who to provide it to. The leaker sent texts to both Bridges and Mallard last week and it goes without saying, all mental health claims have to be taken at face value. By all accounts National acted swiftly to ensure the right approach was taken under the circumstances; engaging professional mental health advice and police. But mental health issues are not a free pass to avoid accountability either and Mallard’s decision makes it hard to shake the impression that Parliament’s institutions are now that much more susceptible to manipulation or worse, blackmail. Mallard has absolved himself of any responsibility for a mental health meltdown. These sorts of threats are unlikely to happen often if at all again, but it leaves questions hanging. In a statement, Mallard seemed to suggest that the case appeared to be closed and Parliamentary Service all but absolved. Not quite. None of the questions that prompted the inquiry to be called, have been answered. While it does at least seem more likely than not that the culprit was within the National caucus, it is not proven. This story can’t just be swept under the carpet in the hope that it will be forgotten. Whether it was a National MP or not, suspicion hovers over all of them. As the axe fell on Curran and the leak investigation, Ardern and Mallard probably thought they were taking decisive action to draw the curtains on separate sagas they clearly did not want to be involved in. Instead, a foreboding fog of unfinished business is settling in the air. Something for journalists to get to work on. Both meetings came as the Government prepared to take significant decisions affecting those broadcast organisations: whether to fund Radio NZ to set up a new public service TV channel; whether to support Government MP Clayton Mitchell’s private member’s bill guaranteeing New Zealanders free-to-air sports. So it is not just Curran’s performance in the open government and digital services portfolios that should be called into question, but also her transparency as broadcasting minister. It is entirely possible that the words “free-to-air” or “piracy” were never mentioned in that evening meeting in the Beehive office; that Curran and Handley were focused on his application for the role of Chief Technology Officer of NZ Inc. But with no notes of the meeting disclosed, no advisers present, and a track record of unreliable answers from the Minister to Parliament itself, the public can have no confidence. And neither can the Prime Minister.